Over the years I've posted pictures of my long-time long-shedding companion of more than 15 years. Sadly, yesterday was the day I held her as it ended. And that is the terrible price of having a pet. You were one hell of a dog ol' girl, but an even better companion. Really sorry to hear. It's never easy. You can see in her eyes what a great being she was. You handled it like a true companion -- holding her in your arms as she passed. That takes guts and a lot of love. remember what you loved best of that sweetie. i finally realized why we lose pets so soon. so we can get more pets to love. i already have ames for the next 2 pairs. + i totally believe in SPARES. my cousin's family will have to deal w/ it. i still miss all my gone cats. Aw, buddy, I am really sad for you. She was lovely. I just lost one of my 14 year-old cats, Murray, over Memorial Day Weekend, and my Dad a month later. I fully understand your grief, and commiserate. Pets are like kids, and the pain of loss is every bit the same, I suspect. Mine passed suddenly in August. Devastating. The family was in tears for weeks. I didn't get the chance to be with him at the end. I'd give the last 5-years of my life to have 2-minutes with him. What everybody else (except the spammer) said . She looks like a good natured friend. I'm so sorry to hear about your loss; the pain is terrible, I know. How wonderful that you got to have 15 years with her, though. I'm so sorry. She looks like a real sweetheart. 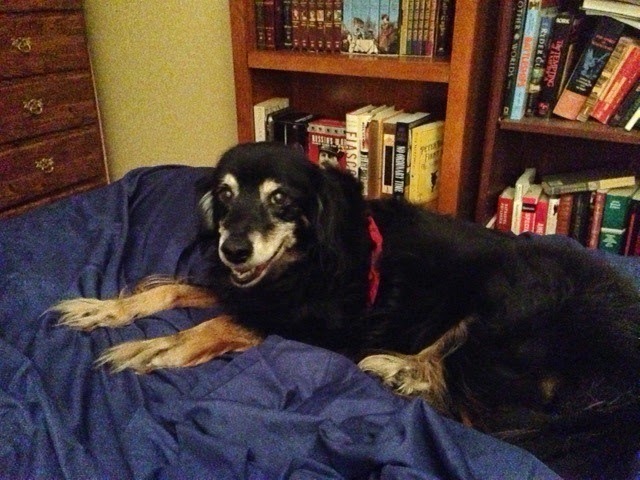 Our Wendy dog is almost fourteen and I see in her the changes that come with age; dimmed eyes, slower responses, more time sleeping on the couch. I know her time is coming and dread it. Our family has dealt with a lot of pets over the years, and fortunately they've all lived good, long lives. Take comfort in knowing you gave her a great home, lots of love, and that she responded in kind. You can't ask for more than that. Geez it's only 11:30 am where I am and I already can't type. I meant lose of course. spare pets are an awesome thing. My condolences on your loss. I too lost my beloved dog, earlier this year. Man's best friend to say the least. 'Tis better to have loved and lost, Than never to have loved at all. So sorry for your loss. She knew she was loved, not all animals are that lucky, so take comfort in that. I have lost dogs and cats through the years, all are so very special in their different ways. The ONLY bad part about having pets, is their life span is too short.She has "Crossed the Rainbow Bridge" and will be there waiting for you. Sorry man ... It's never easy losing a beloved companion. Accept my condolences, man. Pets enrich our lives. They stay with us as long as they can. The only consolation for losing them is the thought that if they lived longer, they'd break our hearts even more. As Mark Twain once said, "When I die, I want to go,where the dogs are." Deepest condolences, Attaturk. Looks like you gave her a good life... which is what matters.